These minimalist earrings were specially designed based on customer favorites. 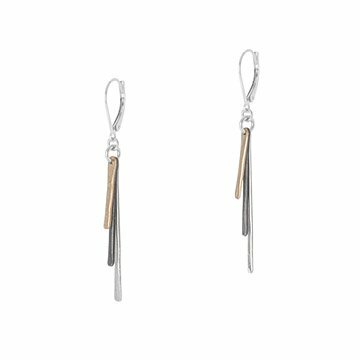 Featuring shimmering sterling silver, black oxidized sterling silver, and gold filled stems in varying lengths, these minimalist earrings were specially designed for you based on customer favorites from UncommonGoods. The chic mixed metals design makes it easy to pair them with your favorite everyday pieces. Finished with sterling silver clasps. Designed by Beth Lawrence and handmade in Tennessee. - Always store it out of the open air and keep it away from chemicals such as sunscreen, hairspray, perfume, etc. Love them! Classy look that goes well with everything! I've been checking the website for 2 years to find something to use a gift certificate on. These earrings are classy, light-weight, go with everything in my closet! These were a great gift for my friend's 41st birthday. She has minimalist taste and she often wears black, gray, white. She loved how they could dress up or down and go with anything. The clasp is very practical for gals with long hair - they are easy to open/ close, but no fears of losing in a scarf or a whip of hair. Lovely product - I highly recommend. I love the look of these earrings. he mixed metal is perfect to wear with so many other pieces of jewelry that I already own. However, I found that the small curve of the earring makes inserting the earring into my lobe very tricky and sometimes pinches. My ears have been pierced for a long time and it has been a long time since my ears hurt putting on earrings. I'd suggest a little revision.. a slightly wider/ longer curve or a hardier hinge to keep earring open. I am really glad that I didn't miss out on these beautiful earrings. Besides complementing many other pieces that I already have they are unique enough to make their own statement when solo. As great as i expected!